Nettlesome Topic? Nettles, Of Course. 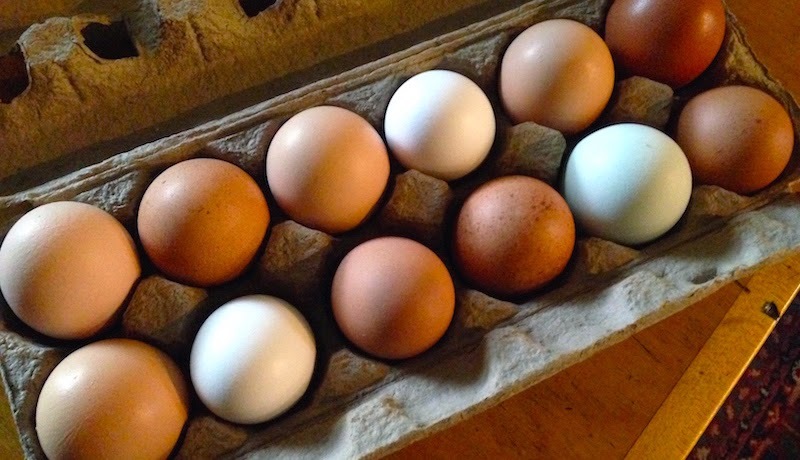 Easy-Peel Farm Fresh Hard-Boiled Eggs…Really! There's a closely held secret that local food advocates aren't telling you, and I feel it's my bounden duty to bust that secret wide open. It's something that most Oregonians sense in the spring, that yearning that comes when the first buds start popping out on the trees and the first baby greens begin appearing on farmers' tables at the markets. It's that tickle of excitement we feel when we think about the strawberries that will soon be debuting onstage, giving way to an avalanche of fruit and summer produce that make cooking and eating such a joy in the Northwest. It's that once you've tasted a Hood strawberry or a green spear of asparagus grown just miles away or an egg plucked from under a hen a few hours before, you can't ever be truly satisfied with anything else. It's both a blessing, in that you've had the pleasure of strawberry juice running down your chin while driving home from the market with a full flat—nobody will notice just one missing, will they?—and a curse, because all the other strawberries flashing their big ruby smiles at you in the supermarket aisle will be a disappointment when you bite into them and the insides are dry and white. It's the same way I pine for the tangerine-colored yolks of pasture-raised chicken eggs from the farm when I'm standing in front of the brightly lit egg case at the store, knowing that when I crack the store-bought versions into the pan, they'll be pale and flaccid in comparison. It's why I'm overjoyed when a farmer friend's "girls" start laying their richly flavored, unctuous treasures again in the spring. 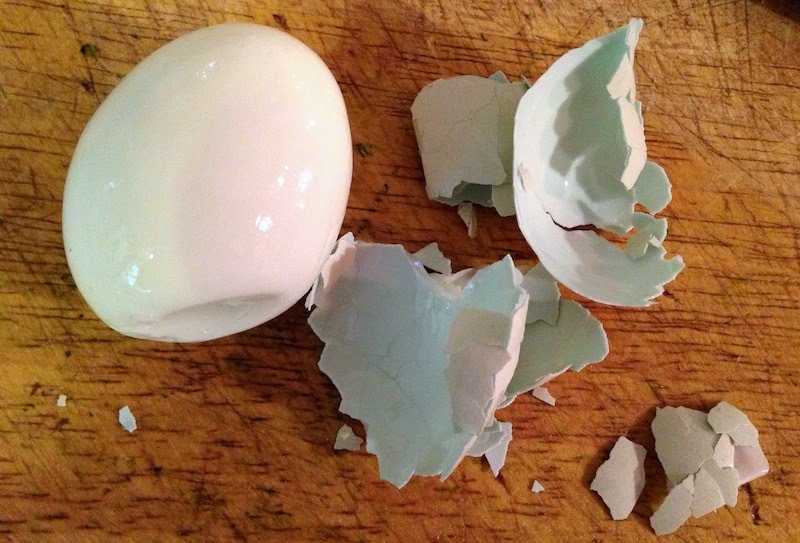 And if you want to use those heavenly fresh eggs for deviling or in potato salad, but have despaired because they're nearly impossible to peel, read this post where I reveal my secret for easy-to-peel hard-boiled fresh eggs. Works like a dream! 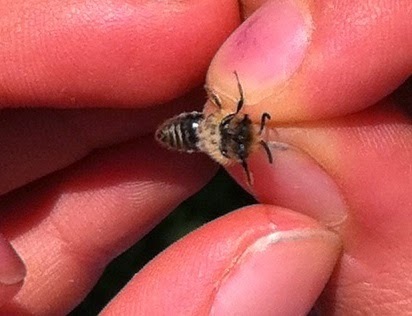 What better way to celebrate insects on Earth Day than with a tale of the simple joy brought to people by bees? 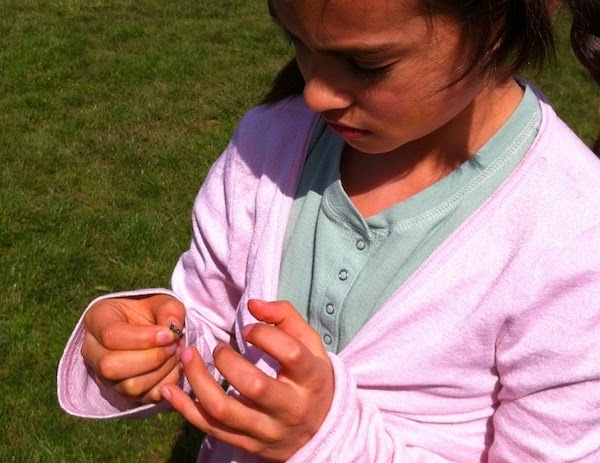 The following essay was written by Mace Vaughan, who co-directs the Xerces Society's Pollinator Conservation Program. Watch a video from KATU-TV of Mace talking about the tickle bees at Sabin School. 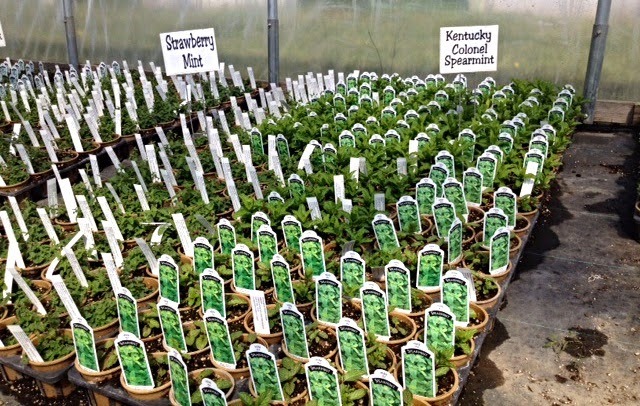 The Beaverton Farmers Market, a longtime advertiser and supporter of good things in the Northwest, has built a selection of top-quality nursery stock from some of the best vendors in the area. That's because market manager Ginger Rapport is an ardent gardener herself, with a strong commitment to helping people get in touch with their food by growing it themselves. Here's her advice on what to plant now. What do you think is the first “app” that a farmer puts on his smart phone? If you said a weather app, you would be right! Chris Hertel of Sun Gold Farm says that he checks his weather app every day. If you are a gardener, he recommends that you do the same, especially this time of the year when high and low temperatures can be all over the place. This weekend’s warm weather will have most of us chomping at the bit to start planting our vegetable and herb gardens. Chris says that the most important plants to get in the ground right now are peas and brassicas—cabbage, cauliflower, broccoli, etc. They like the cool weather, as do lettuce, spinach, chard and other greens. If you want to get a jump on summer, Sun Gold’s booth will have plenty of tomato, pepper, eggplant, cucumber and squash starts on hand. These heat-loving plants may need a little bit of protection if the night time temperatures dip too low. This is where your weather app comes in handy! If it looks like we are going to get near freezing, Chris suggests that you protect your hot weather veggie starts with something as simple as a paper bag placed over them. Even a crude greenhouse made of sticks and plastic will work. Of course, you will want to uncover your plants during the day. You can also start perennial herb gardens now. A perennial plant is one whose life cycle lasts for more than two years, so think of herbs like mint, chives, bay, oregano, sage and rosemary. This does not include basil or cilantro; hold off on those tender herbs until nighttime temperatures warm up. 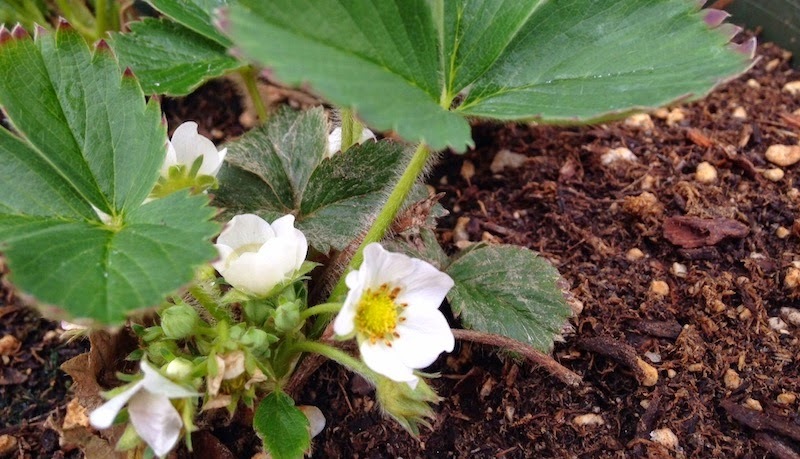 And believe it or not, now is the time for planting strawberries! Hood Strawberries are a market favorite. They are a super sweet berry with the entire crop coming over a short period of time. Sun Gold will also have an everbearing variety called Tri-Star that will keep you in fruit for a longer period of time. Lastly, it is not too late to plant blueberry bushes. Both Sun Gold Farm and Northern Pacific Farm will have a wide variety of blueberry bushes in their stalls this Saturday. Ask for advice on selecting the variety best suited for your tastes. 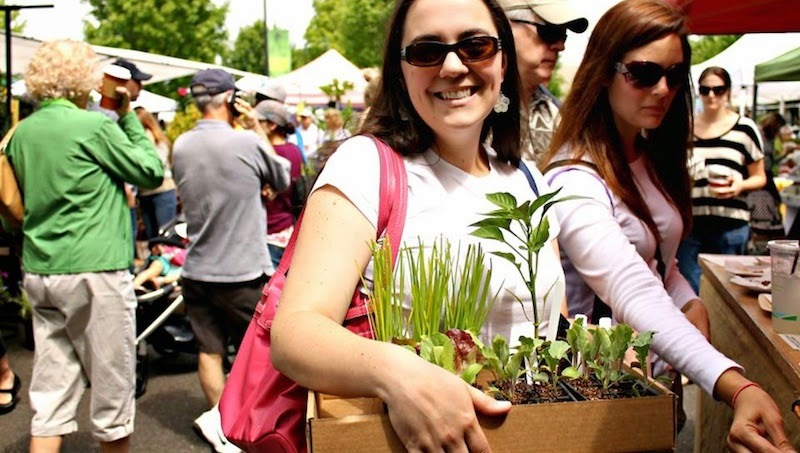 The Beaverton Farmers Market is kicking off their summer season a full week ahead of schedule, so make plans to get your summer going on May 2nd from 8 am to 1:30 pm. 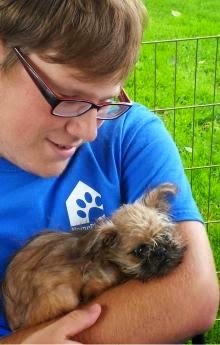 If you happen to have a furry friend with you, the market offers Sit-n-Stay, a drop-in dogsitting service adjacent to the market run by Home Plate Youth Services. Open from 7:30 am until 2 pm, it'll cost just $5 for the first 30 minutes, then $2.50 for each additional 15 minutes after that. Additional donations to HomePlate's program serving young people with precarious housing are welcome. I don't know if this is true of other cooks, but I can't seem to follow a recipe to save my life. 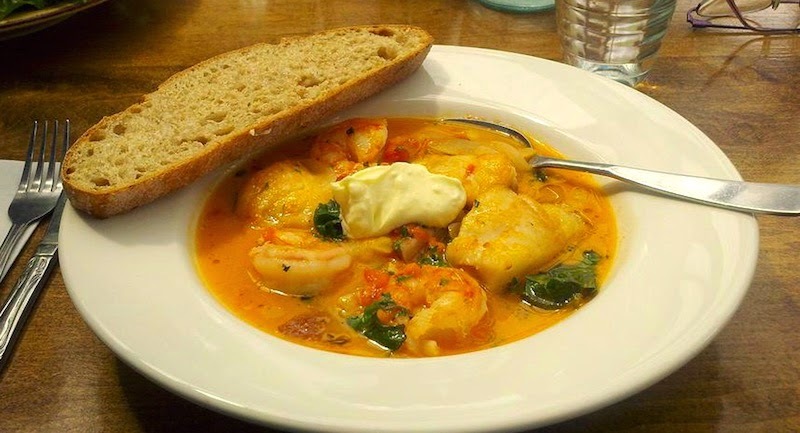 Even though I consider myself a recipe-dependent cook rather than one of those people who, like my friend Denise, freestyles her way through ingredients, following her intuition to come up with creative, fabulous meals. This entire blog is a testament to my need for guidance, chock-full as it is of favorite recipes gleaned from family dinners and camping trips, or—ssssshhhh…don't tell!—stolen from friends. So the other day when I was browsing through the New York Times magazine and saw a gorgeous photo of a dish of roasted chicken legs, I had to stop and check out the recipe. The article, by the Times' food editor, Sam Sifton, whose writing I find pretty irresistible, clever without being one of those "Look at me! Look at me! I can do a double flip!" food writers, was an interview with the designer Steven Stolman. 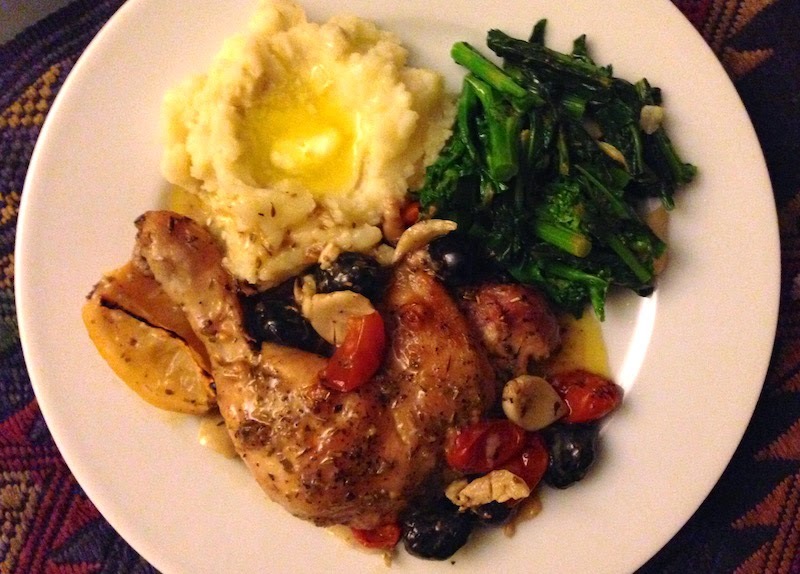 He'd first had the dish, called Roasted Chicken Provençal, as a college student in New York. Sifton wrote, "the chicken was seasoned with spices meant to evoke the flavors of southern France: rosemary, thyme, bay leaf, lavender, marjoram, chervil, sage. It all seemed exotic and wonderful to Stolman, a child of the Hartford suburbs and new to Manhattan. 'I thought it was the coolest thing,' [Stolman] said. The dish and the evening left an impression on him that has lasted for almost 40 years." A couple of paragraphs later Sifton wrote, "it is still the coolest thing: chicken dusted in flour and roasted with shallots and lemons and vermouth under a shower of herbes de Provence until it has gone crisp above the fat and wine and lemon juice, and the shallots are melted and sweet." It's a dead simple recipe, and with my crazy love of roasted chicken it seemed like a natural for a test run. And that's where I went ever-so-slightly off the rails. You see, I had almost everything the recipe called for…except shallots. Hm. While it sounds like they're pretty crucial to getting the dish just right, I've also cooked enough chicken to know that shallots aren't a make-or-break ingredient. So I decided to throw in a few extra garlic cloves and call it good. Then I saw a half-full basket of cherry tomatoes left over from a vinaigrette I'd made a couple of days before sitting on the counter. Those'd be good, too, and still keep it in the Provençal theme. Pulling the chicken out of the fridge my eyes fell on a dozen or so leftover oil-cured olives. They're Mediterranean, too, right? Except for those "tweaks," if you can call it that, I pretty much made the chicken as originally intended and it was indeed as wonderful as advertised. Like Stolman, I'll definitely make it again and probably serve it to company. Maybe I'll even follow the recipe. Preheat oven to 400. Season the chicken with salt and pepper. Put the flour in a shallow pan, and lightly dredge the chicken in it, shaking the pieces to remove excess flour. Swirl the oil in a 9” by 12” pyrex roasting dish, and place the floured chicken in it skin-side up. 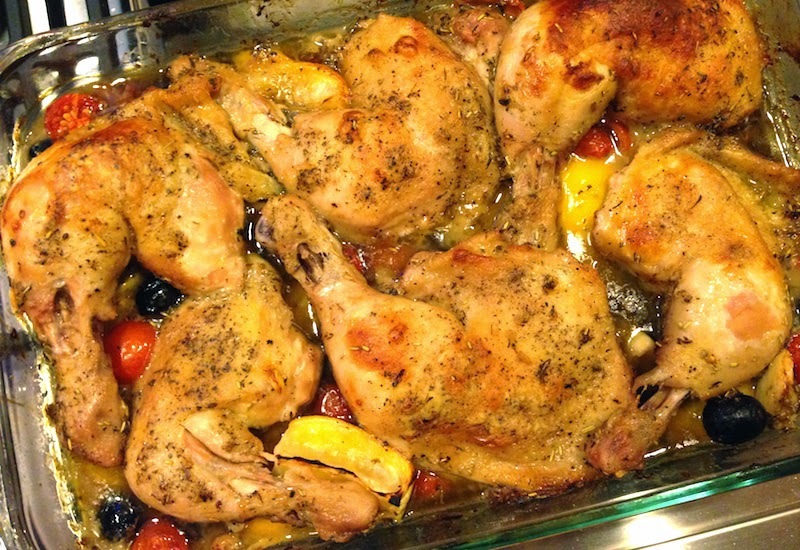 Season the chicken with the herbes de Provence. 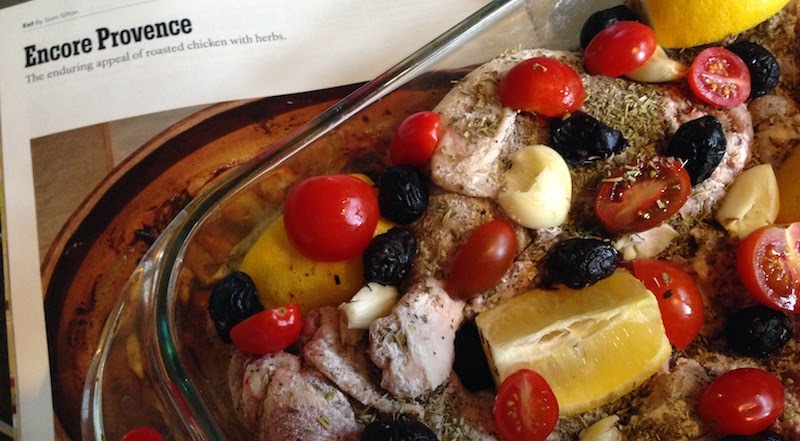 Arrange the lemons, garlic cloves, cherry tomatoes and olives around the chicken, and then add the vermouth to the pan. Put the pan in the oven, and roast for 25 to 30 minutes, then baste it with the pan juices. Continue roasting for an additional 25 to 30 minutes, or until the chicken is very crisp and the meat cooked through. One of the scariest phrases I've ever heard, and one I've tried to avoid thinking about, is "antibiotic resistant bacteria." It means that a bacteria has developed a genetic mutation that makes it resistant to an antibacterial agent like antibiotics. There are now antibiotic resistant forms of Staphilococcus aureus (also known as MRSA), E. Coli, Streptococcus pneumoniae, influenza and others. The World Health Organization (WHO) stated in a report released in 2014 that "this serious threat is no longer a prediction for the future, it is happening right now in every region of the world and has the potential to affect anyone, of any age, in any country. Antibiotic resistance—when bacteria change so antibiotics no longer work in people who need them to treat infections—is now a major threat to public health." Why am I bringing this up in a post about the 2015 session of the Oregon legislature? It turns out that a dear friend of mine recently died because he contracted a drug-resistant form of E. Coli while being treated for cancer. That's very sad, you might think, but, again, what does that have to do with the legislature? It turns out that there's a bill in the state Senate, SB920, that seeks to limit the use of antibiotics on otherwise healthy animals by Oregon's livestock industry. If national statistics are any indication, 70 percent of "medically important" antibiotics—i.e. those that are used to treat diseases in people—are used in the livestock industry on perfectly healthy animals. The practice of administering regular doses of antibiotics in animals' water and feed developed because it was widely believed that antibiotics promoted the growth of the animals and because most of the animals we consume for food, including chickens, pigs and cattle, are raised in confinement in crowded, unsanitary and stressful conditions. According to an article in the Salem Statesman-Journal, opponents of this bill say that regulation should be left up to the federal government. Unfortunately, in addressing this issue in 2012, the Food and Drug Administration only asked the industry to voluntarily refrain from using medically important antibiotics as a growth promoter while allowing the industry complete freedom to use these same drugs to "prevent" disease. Meaning it could continue its practice of using these drugs in the same way and at the same rate as before. How has that tactic worked? 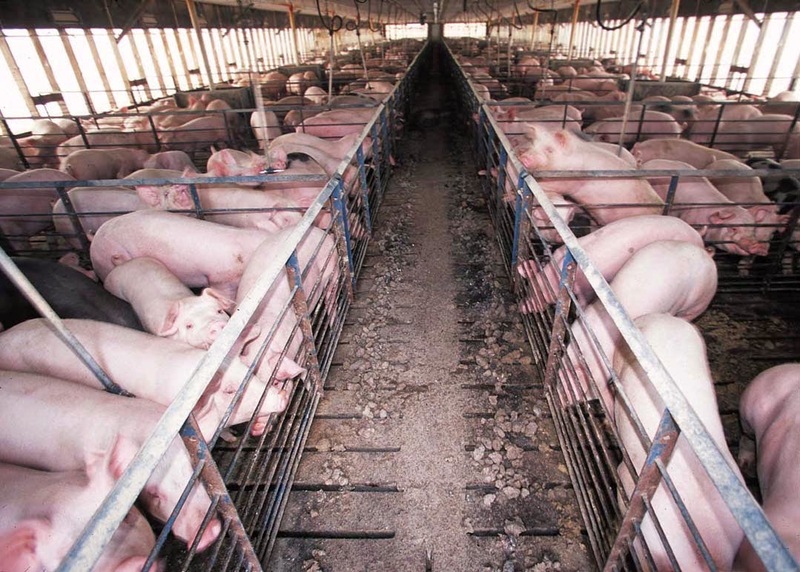 In an article in Mother Jones magazine, reporter Tom Philpott quoted FDA statistics indicating that between 2012 and 2013 the use of medically important drugs on these factory farms actually grew by 3 percent. 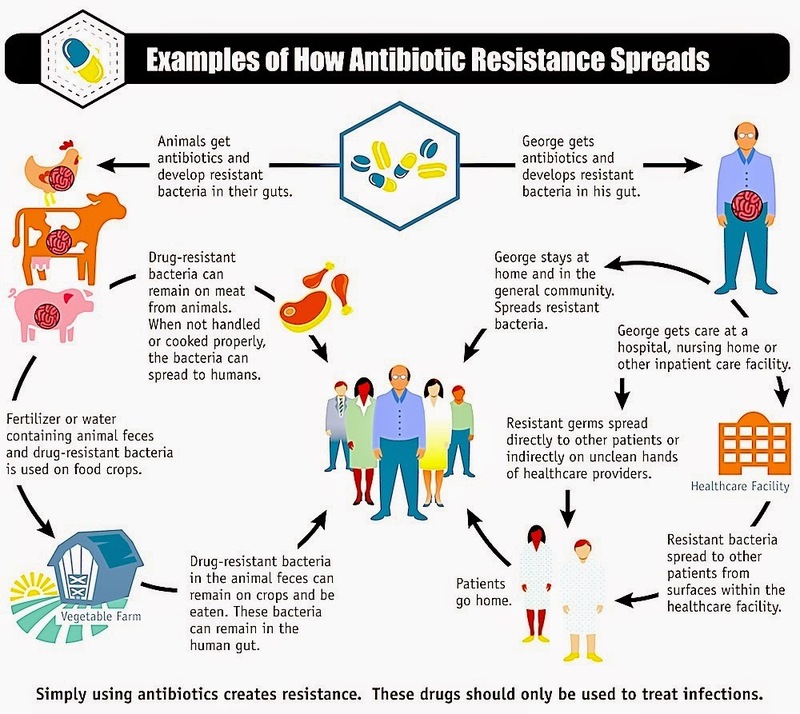 SB 920 requires that antibiotics used on livestock be used responsibly in order to prevent the spread of antibiotic resistant bacteria, allowing farmers, as well as veterinarians, to use antibiotics to treat illness and infections in sick animals. 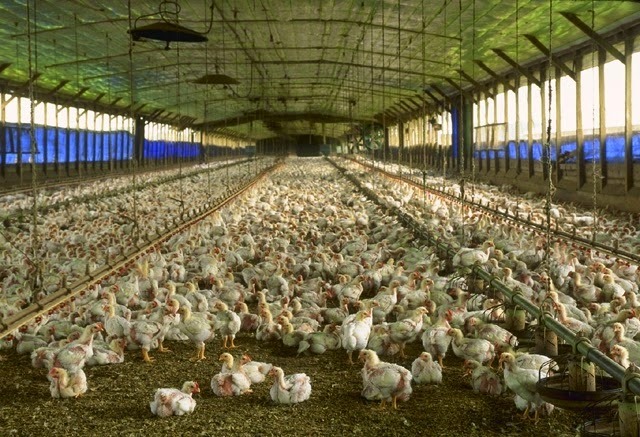 SB 920 prohibits giving farm animals low doses of antibiotics in feed and water for growth promotion and 'disease prevention' in perfectly healthy animals to mask unsanitary conditions in the facilities that animals are raised in. The bill requires the largest federally regulated concentrated animal feeding operations (CAFOs) in Oregon to report annually on their use of antibiotics, which is key in tracking how much antibiotics these operations are using and whether their practices are contributing to the development and spread of antibiotic resistant bacteria. New FDA rules and White House initiatives contain huge loopholes for factory farms to feed antibiotics to healthy animals under the guise of 'disease prevention.' SB 920 closes this loophole. 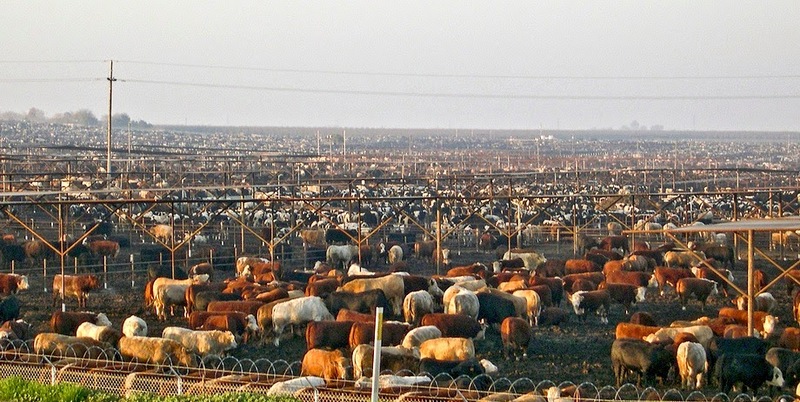 Antibiotic resistant bacteria can be spread to humans through handling the meat, through airborne dust from manure, and through manure from factory farms leaching into waterways. Read the other posts in the series: Opening Salvos, The Good, The Bad and the Ugly, The Fight Takes Shape and Hanging in the Balance. Thanks to Friends of Family Farmers for the talking points mentioned above. I know it's unfashionable to use the adverb "literally." But I have been hungering for spring. Literally. I was seeing those first shoots of rapini in my dreams—literally—and imagining the whorls of fiddleheads, spears of asparagus and nettle leaves that were soon to make an appearance on my plate. 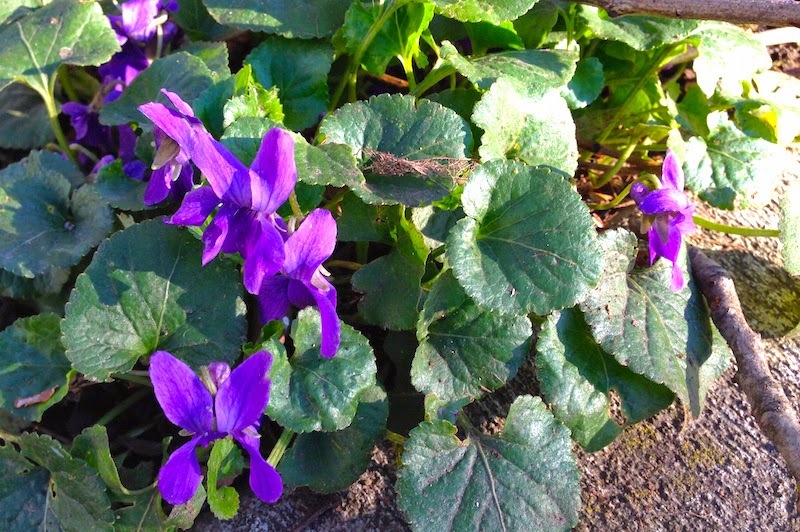 Spring was apparently as anxious as I was to make her debut on our Northwest stage, and I was shocked to discover, in mid-January, miner's lettuce popping out of the ground on parking strips and the scent of violets in the air. 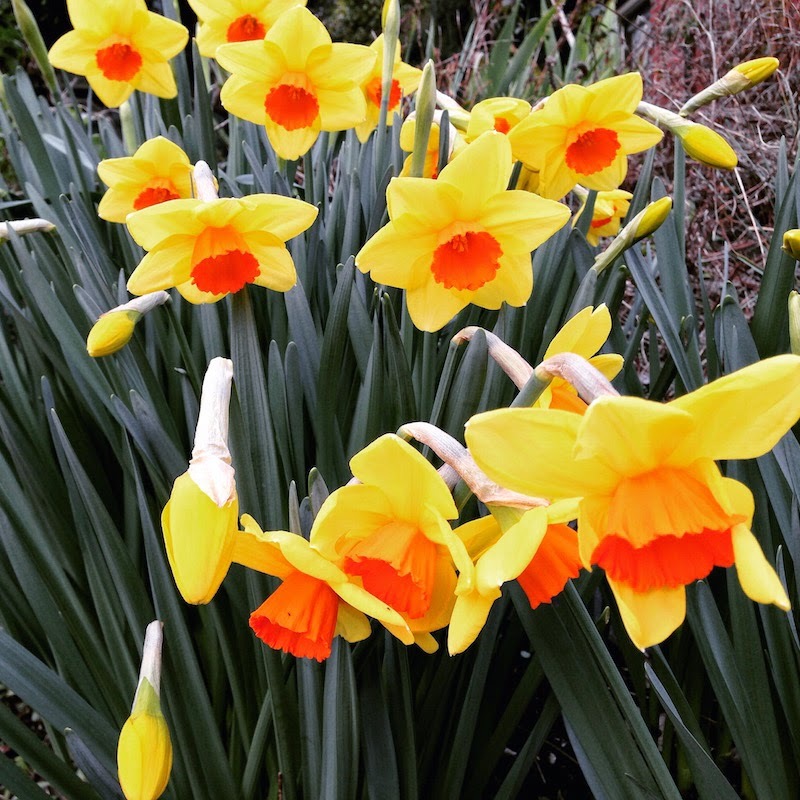 By mid-February all hell had broken loose and those earlier scofflaws were joined by rogue daffodils bobbing their yellow heads on sunny slopes and heady clouds of perfume from daphne and witch hazel drifting by on my walks through the neighborhood. Can you blame my stomach for getting a little rumbly? So when just before Easter my friend Michel, source of much goodness on our table, mentioned that her new favorite brunch was poached eggs on kale dressed with a cherry tomato vinaigrette with Reggiano, I heard a little "ping" in my head. Not just about the poached eggs on kale, which sounded heavenly, but the cherry tomato vinaigrette that had somehow hit just the right note in my spring greens-obsessed brain. With my nephew bringing his parents over for a brunch-and-Easter egg-fueled extravaganza, I thought Michel's creation might just make a delicious and colorful counterpoint to some bright green asparagus spears. Served alongside a garden-herb-and-cheese-stoked frittata, my craving was satisfied. For the moment. In a small mixing bowl combine ingredients and allow to macerate for an hour or so on the counter. 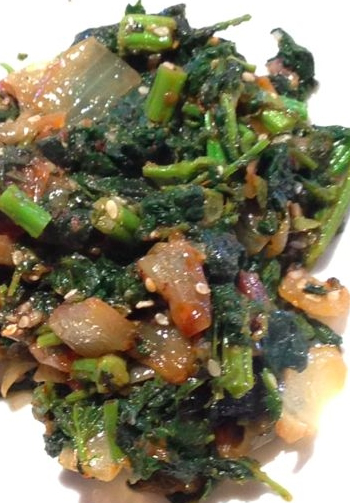 Toss with your favorite sturdy greens like kale, asparagus, rapini, etc. Episcopalians are party people. At least that's the impression I got growing up in Redmond, part of the Diocese of Eastern Oregon, which takes up two-thirds of the eastern side of the state of Oregon. That impression came from the frequent gatherings of their church friends that my parents convened at our home. Now I know that might conjure visions of polite ladies in white gloves sitting primly in straight-backed chairs sipping tea, but, let me tell you, these were anything but. Rusty at our wedding reception. Wine flowed, plates of food were passed, loud arguments (but not angry—it was the 60s, after all) erupted and much laughter was heard from my hiding spot at the bottom of the stairs, where I would crack the door, the better to eavesdrop on the adults' conversations. Always at the center was Rusty, known to the rest of the world as the Reverend (and eventually Bishop) Rustin R. Kimsey, and his wife, Gretchen. 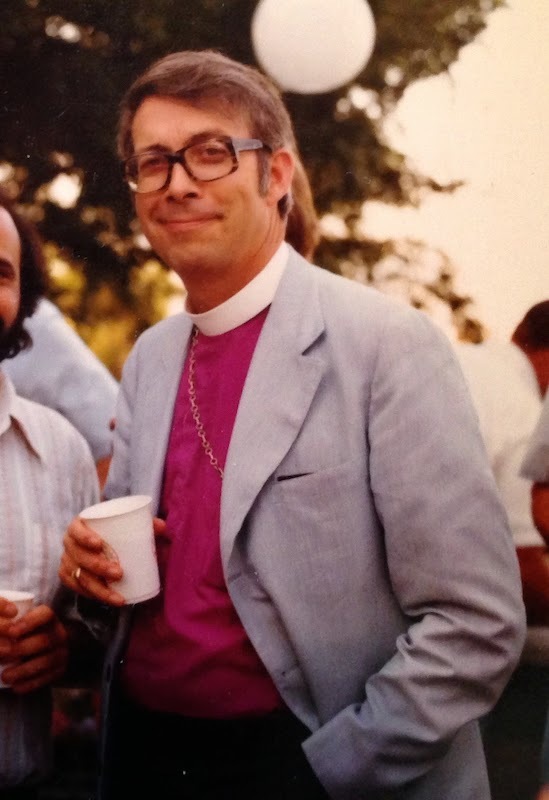 St. Alban's Episcopal Church in Redmond was his first assignment, and though he would go on to pastor churches in Baker City and The Dalles, Rusty—not Father Kimsey, Rev. Kimsey or any other honorifics, just call him Rusty, if you don't mind—was always challenging his own and other's beliefs. In a piece in the Bend Bulletin from January 7, 1967, titled "The Servant Church," the young rector asked, "What is the role or purpose of the Church in society? "Jesus’ primary mission his life was to serve mankind….There are times when the Church neglects this basic calling to serve mankind. Too often Christianity becomes a comfortably institutional bureaucracy and neglects its service to others. 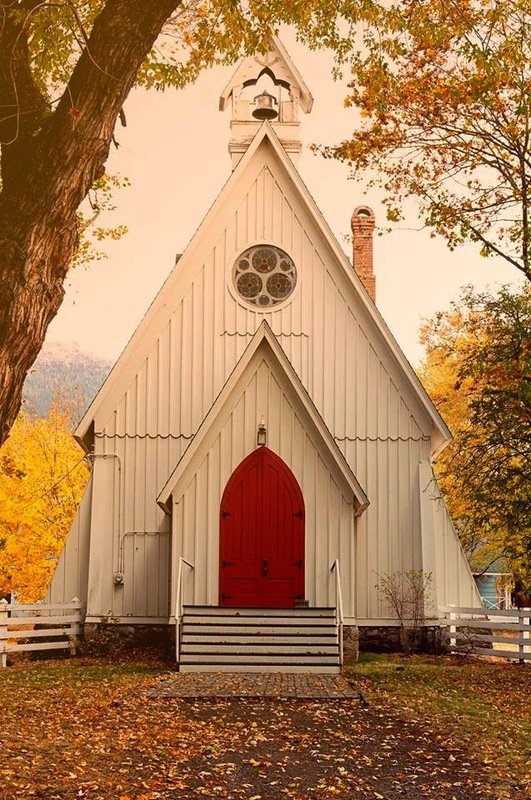 Too often the Church becomes so mindful of the 'housekeeping' within that it forgets the deep needs of those outside its doors….It is most evident that the roads of peace and brotherhood must still be paved with compassion, understanding, justice and, most of all, love." His questioning was reflected in his passion for the small Episcopal summer camp in Cove, in far Eastern Oregon, where the children of the diocese spent glorious days swimming in the local geothermal pool and going on trail rides in the hills. Amid the rolling green cattle pastures of that valley he invited some of the most controversial voices of the Episcopal church of the day to its sprawling lawn, including James Pike, Bishop of California, who in the early 1960s was a proponent of ordination of women, racial desegregation, and the acceptance of LGBT people within mainline churches, who narrowly avoided being branded a heretic. These family retreats also featured the theologian Bishop John Shelby Spong and anti-apartheid activist and eventual Nobel Prize-winner, and Rusty's close friend, Bishop Desmond Tutu. Years later Rusty would officiate at our wedding, unconcerned about the fact that we were, as the quaint turn of phrase at the time had it, "living in sin" or that we had, in another dated phrase, a "mixed marriage," i.e. Episcopalian/Catholic. And despite our mostly non-churchgoing ways, he was always there when we needed him, to baptise our son or to perform the funeral services when my parents died. An influential figure nationally, willing to speak out on issues and question entrenched beliefs, he was also a great friend and mentor, always ready to gather you in his arms for a hug. After contracting a drug-resistant form of E. Coli while being treated for cancer, he died in his home in The Dalles on the evening of April 10, 2015. 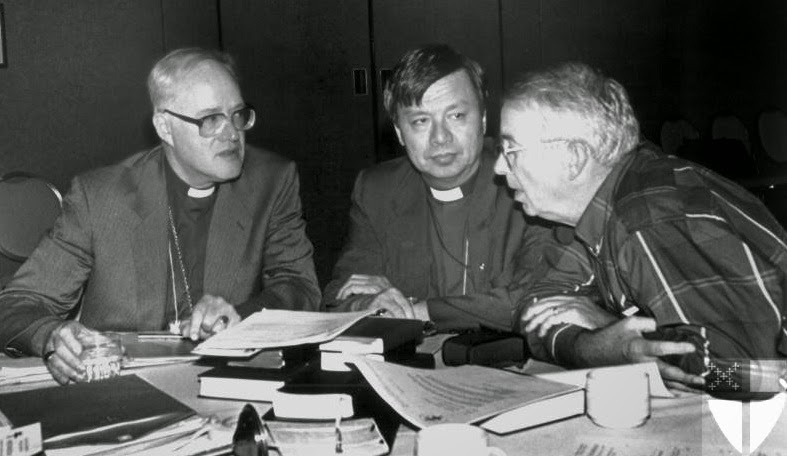 Top photo: Rusty (right, in shirtsleeves) leaning in to make a point with Archbishop of Canterbury George Carey and Bishop John Chien of Taiwan in 1992. Episcopal News Service photo by Bob Stockfield. We've all watched the videos of people walking and texting, the ones where the texter falls into a fountain or splats into some wet cement. I see it around me when neighbors walk by, absorbed in their phones when they're walking their dogs or, worse, strolling with their children, missing the opportunity for connection. My friend, journalist, hunter, forager and author Hank Shaw, recently published an essay on this phenomenon, and has given me permission to post an excerpt. I encourage you to click through to read the entire piece. I went for a walk today, and found myself surrounded by zombies. One of the places where I wander around to read nature’s news also happens to be a spot that on any given sunny weekend is choked with walkers, runners and bikers. On those rare weekends when I venture out into this, I feel oddly out of place, like those people who stand still in Times Square while being photographed in time lapse: a rock in a raging torrent of humanity. This is not to say that I sit motionless on a bench like some octogenarian feeding pigeons. I actually do end up walking five miles or so on a given day, but it can often take me several hours because, well, to read the signs of the natural world you must slow yourself down. Slowing down: A concept so alien to most modern Americans that they view it as a sign of weakness. On the contrary, an overly regimented life is one empty of wonder. And wonder is no weakness. I honestly have no real way of gauging the inner lives of those earnest exercisers around me, but their exterior isn’t pretty. At best their eyes appear vacant, their minds focused on whatever it is they are listening to on their headphones. At worst they look like the damned in a Hieronymus Bosch painting. As I walk through this bustle, noting the comings and goings of flowers and fruits and leaves, checking to see what schedule life seems to be taking this year, I am almost never noticed, even though I might be picking up pine nuts off the ground or collecting seeds or elderberries or mustard greens in full view of the good people of the path. I used to think everyone just thought I was a crazy homeless person and were consciously avoiding eye contact. That does still happen, but I’ve learned to recognize the difference between that and those who truly don’t register my existence. This obliviousness fascinates me. Why, if you are so intent on whatever it is blaring itself into your skull, are you out in nature at all? Wouldn’t a treadmill suffice? Of course it won’t. I was once a runner. A competitive one, even. So fast there was no possible way I could truly appreciate my surroundings. But I did, or at least I told myself I did. Nature exerts a sort of osmotic pressure on us all, seeping into those who lack nature within themselves even if ignored, much the way a salt brine works in meat. Even something as simple as sun on your head and a breeze in your face makes a world of difference. Yet to me, a forager, they all still seem zombies. The difference is one of degree, I suppose, a sliding scale ending with the wild animals who live along this path. As intimate as I am with nature, my life does not depend on it the way a squirrel or goose or scrub jay’s does. For those of us who slow down and take the time to really look at their surroundings, we at least get to borrow that sight a wild thing possesses permanently — a sight the cyclist or runner can never attain (at least while they’re hurtling through nature rather than looking at it). 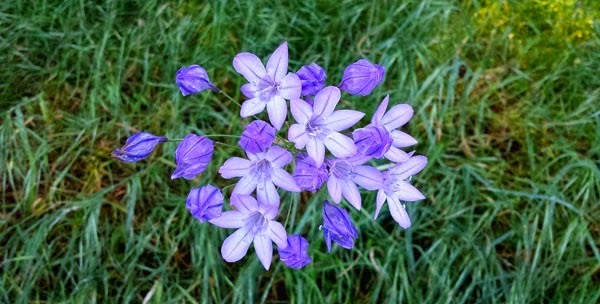 Photo of ithuriel's spear by Hank Shaw. That 100-mile diet that was all the rage a few years ago? So passé! 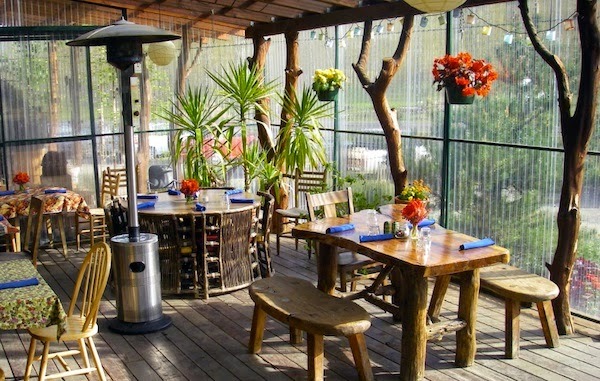 At one farm in Oregon's mid-valley you can dine on food that comes from 100 feet away. 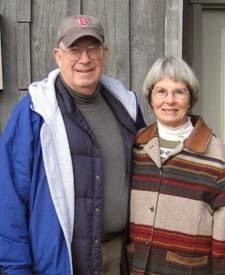 In 2003, farmers John Eveland and Sally Brewer of Gathering Together Farm opened what they thought was just going to be a farm stand selling their organically grown produce along with pastries, soups and salads. But demand was so great that they eventually opened for lunch, dinners and Saturday breakfast, hiring Chef J.C. Mersmann and bringing in locally grown meat and products from other neighbors. They've just opened the restaurant for the spring season, with lunches Tuesday through Friday and dinners Thursday through Saturday. And keep your eyes peeled for their summer wine dinners, which are said to be some of the finest, not to mention freshest, dining available in the state. Details: Restaurant at Gathering Together Farm. Lunch Tues.-Fri., 11 am-2 pm; Dinner Thurs.-Sat., 5:30-9 pm; Breakfast Sat., 9 am-2 pm. 25159 Grange Hall Rd., Philomath. 541-929-4270. There's no better way to understand more about the meat you eat than to take a butchery class, and we're lucky to have several places where you can learn how animals are raised, how to break down a whole carcass and then how to make use of every single part to feed your family. Listed below are three places that have regular butchery classes, teaching everything from how to fillet a fish, to breaking down a chicken or rabbit, to butchering a lamb, goat or pig. Check out their classes online, or take a gander at the calendar on the left. From personal experience, I guarantee it'll be an eye-opening and meaningful, not to mention delicious, way to get closer to your food source. Old Salt Marketplace just released its spring and summer schedule of classes. 5027 NE 42nd Ave. 971-255-0167. 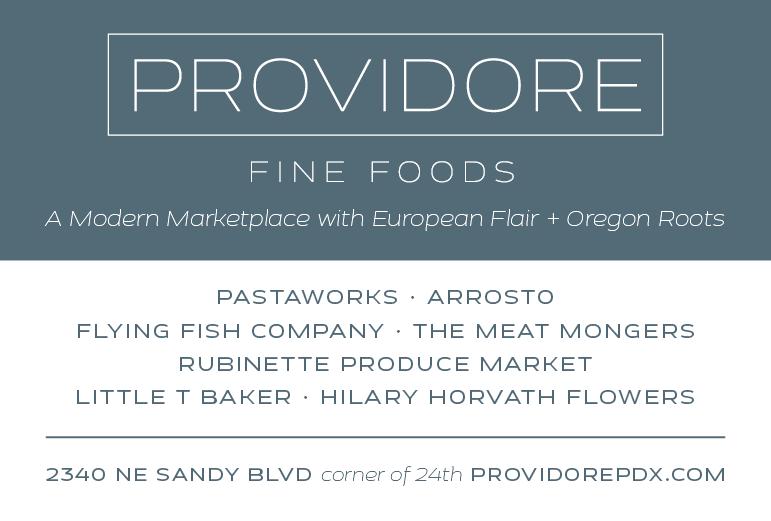 Portland Meat Collective has a full lineup of classes for all kinds of butchery. At Elder Hall, 3929 NE MLK Jr. Blvd. 503-347-5540. 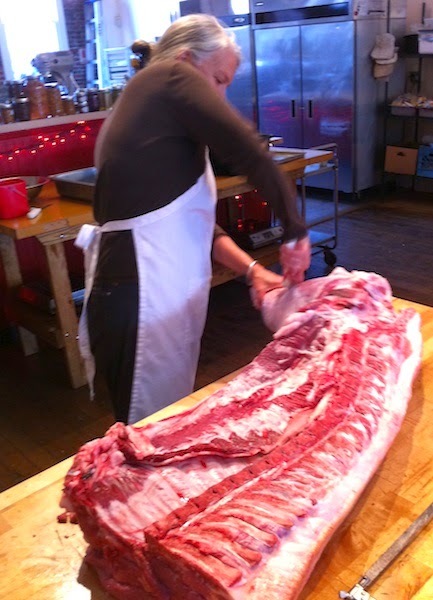 Portland's Culinary Workshop features butchery classes with a turducken class at the holidays. 807 N Russell St. 503-512-0447. Every parent knows how hard it is to keep teenagers interested and engaged during their high school years. It's even harder when kids come from challenging backgrounds. 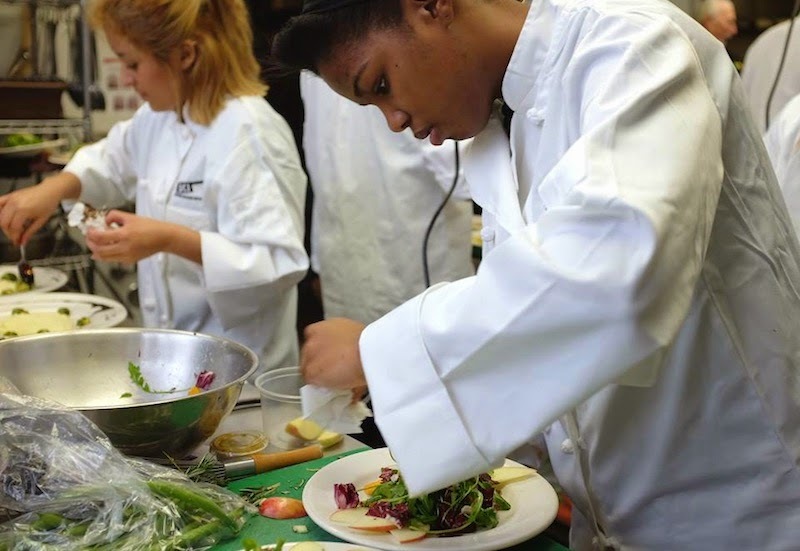 The Portland Kitchen is a free, comprehensive culinary program for urban kids from disadvantaged families, empowering them to graduate high school with job skills and improved eating habits. A friend of the program has pledged to match donations between now and May 15, dollar for dollar up to a total of $25,000, an amount critical for it to move into its third year of serving area youth. If you can, please consider helping them reach their goal. 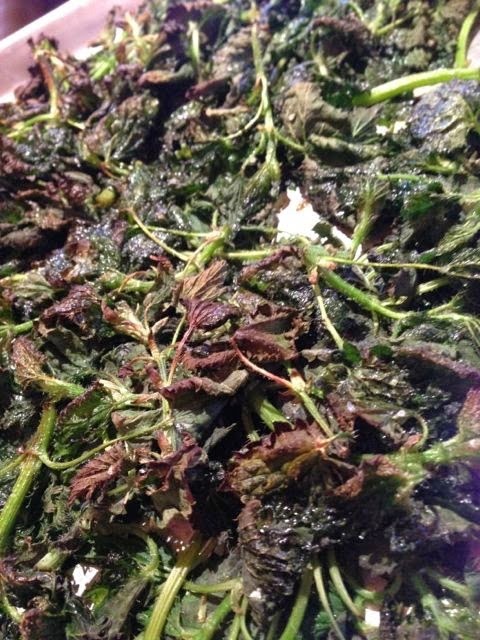 One of the first signs of spring in the Willamette Valley is the appearance of nettles, which pop up on farmers' market tables with signs labeled "Don't Touch! Ask farmer for assistance." 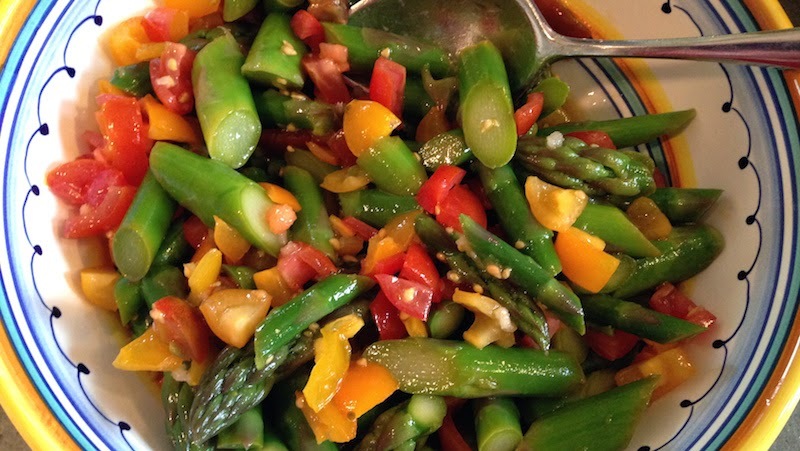 Jim Dixon of Real Good Food is a big fan, and he links to several recipes here. Tiny glass-like needles, each with a bulbous base filled with chemical irritants, cover the leaves of stinging nettles. 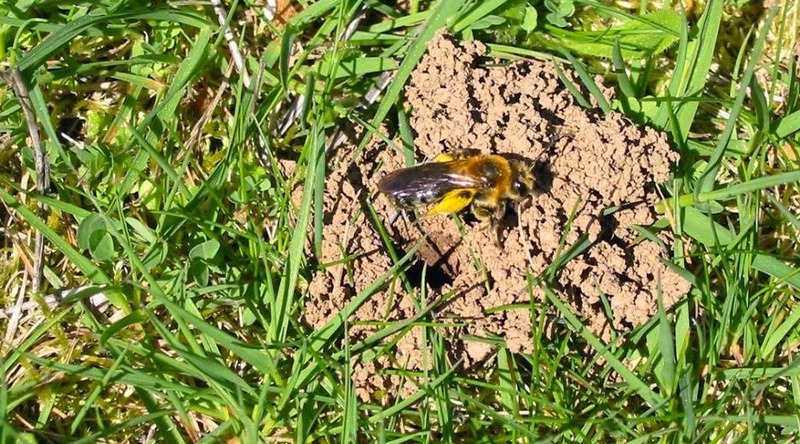 The lightest touch shatters them and unleashes a poisonous brew of neurotransmitters, histamines and formic acid, the same acid that makes bee stings and ant bites so painful. The smart thing is to avoid stinging nettles altogether. Heat neutralizes their sting, and when cooked, nettles have a robust, almost meaty flavor. The leaves are high in calcium and iron, and studies have confirmed their effectiveness as an anti-inflammatory, a use that goes back to ancient Greece. While nettle greens can be used in any recipe that calls for spinach, one of my favorite way to eat them is an adaptation of a recipe from Faith Willinger’s Red, White, and Greens: The Italian Way with Vegetables cookbook. Called subrich (soo-brick) in the Piemontese dialect of northern Italy, these are basically little eggy fritters. If the mint has come up in my garden, I make nettle and mint fritters, but you can use the same recipe without the mint. Nettles are also good roasted, cooked with caramelized onions and za'atar, or sautéed with thinly sliced garlic and finished with cream. Nettles with onions and za'atar. Stinging nettles (Urtica dioica) grow throughout North America, but are especially abundant in the wet coastal forests of the Pacific Northwest. Anyone who’s inadvertently stumbled into a patch remembers what they look like, and it’s easy (if painful) to test a leaf to make sure it stings. 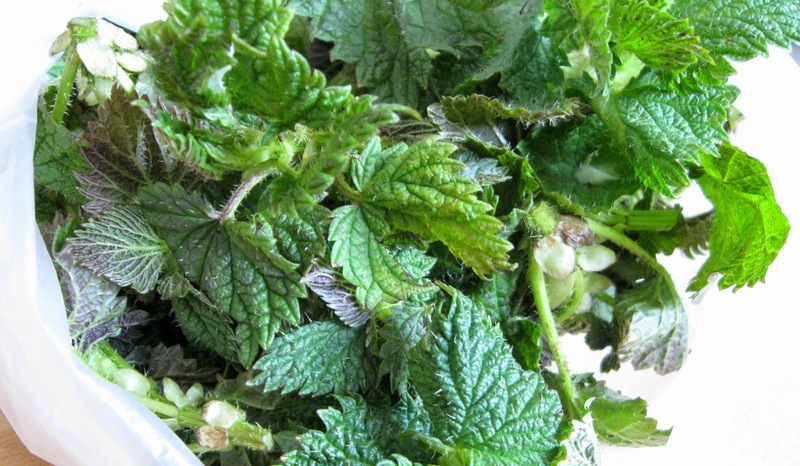 Bring along an experienced forager if it’s your first time out nettle-gathering, make sure you have good gloves and don’t eat the leaves if the nettles have flowered or gone to seed. After that point, they develop bits of calcium carbonate which may cause urinary-tract irritation. You can often find nettles at the Portland Farmers Market (check with Roger and Norma at Springwater Farms) and sometimes at New Seasons Market. More nettle recipes? Sure! Try this nettle flan, or how about a pork leg roast with nettle pesto stuffing? Oh, and this spring leek and nettle tart is to die for! 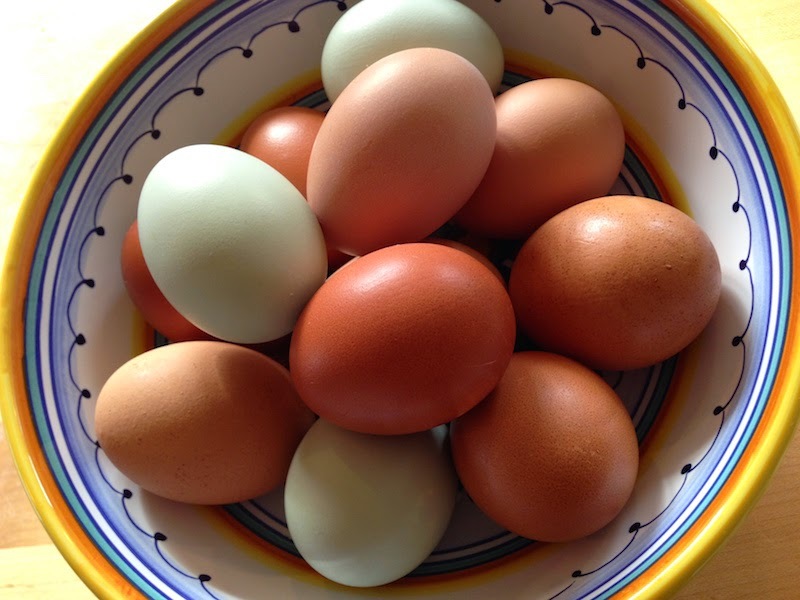 With Easter weekend coming up and farm-fresh eggs rolling into farmers' markets this weekend, the idea of dyeing some incredibly delicious, plucked-from-the-nest eggs for that Easter egg hunt sounds like a great idea, doesn't it? 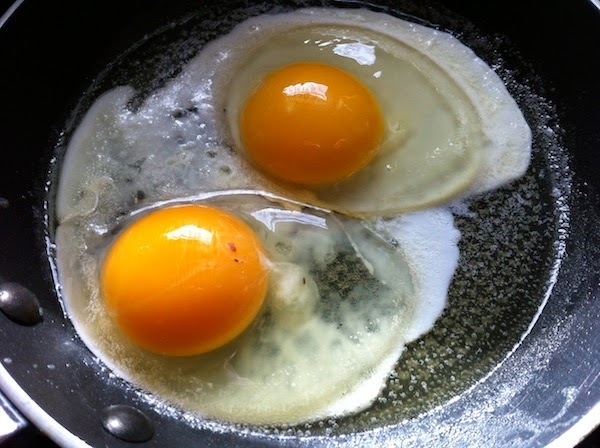 But wait, you think, aren't fresh eggs unbelievably hard to peel without half the white sticking to the shells? 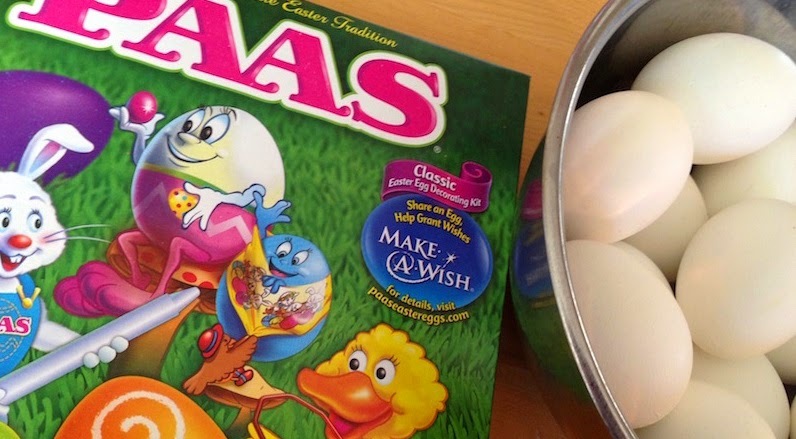 Peeling hard-boiled fresh eggs can be easy! The answer is that they can be if you try to cook fresh eggs as you would the regular ones from the store, which might be as much as a month old. But if you take advantage of the technique I picked up a couple of years ago that make the shells practically fall off in your hands, you'll have incredibly beautiful, pristine eggs to use for post-Easter deviled eggs or for shredding on tender spears of blanched asparagus. Seriously, give this technique a try…you won't have to be embarrassed at serving tasteless, conventionally grown hard-boiled eggs again! Make sure your eggs are at room temperature (very important!). This will reduce cracking when submerging them in boiling water. Slowly lower the eggs into the boiling water. When boiling resumes, set timer for 15 minutes and reduce heat to keep water at a low boil. When timer goes off, drain eggs and submerge in ice bath until chilled, then peel. Get my recipes for Spanish-style Deviled Eggs and Curried Mustard Deviled Eggs.